Learn how to calculate the slope of a line. A straight line has several properties that you can measure or calculate. One of the property is the slope. In this lesson, you will learn how to formulate and calculate the slope of a line. Note that, the slope is also known as the gradient. This lesson is divided into 2 parts. The first part is to help you to familiarize with the terms 'change in x' and change in y'. The second part is the actual lesson on the slope of a line. When calculating the change, always 'run' first and then 'climb' up. The math video will illustrate more. Know how to calculate the 'change in x' and 'change in y' before attempting to calculate the slope. This minimizes mistake. Now, what is the definition for the slope of a line? It is defined as the ratio of the 'change in y' to the 'change in x'. This simply means that you just divide 'change in y' with 'change in x' to find the slope. Now, watch the following math videos to know more. This lesson will explains to you on how to calculate the 'change in x' and 'change in y'. When you do the calculation, it is important to first run, and then climb. What does this means?. The following example will explain it. Imagine, that you are at this point right over here with x-coordinate of 2. Now, you run towards the right, notice that your x-coordinate increases. Now, you see that your current x-coordinate is 5. You can calculate the change in x, by taking the current x-coordinate, 5, minus the original x-coordinate, 2. This gives the change of x of 3. Now, let's take a look at the change in y. You are currently at this point with y-coordinate of 2. When, you climb up from here, your y-coordinate increases. (Increase y-coordinate from 2 to 5). You see that now, your y coordinate is 4. You can calculate the change in y, by taking the current y-coordinate, 4, minus the original y-coordinate, 2. This gives the change of y of 2. Alright, for this example, you have the 'change of x' equals to 3, and 'change of y' equals to 2 . Let's take a look at another example. Imagine, that you are at this point right over here with x-coordinate of 3. When you run towards the left, your x-coordinate decreases. Now, you see that your current x-coordinate is negative 2. You can calculate the change in x, by taking the current x-coordinate, negative 2, minus the original x-coordinate, 3. This gives the change of x of negative 5. Now, let's take a look in change in y. When you climb up from here, your y-coordinate increases. 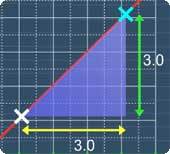 (Increase y-coordinate from -4 to 2). You see that your current y coordinate is 2. You can calculate the change in y, by taking the current y-coordinate, 2, minus the original y-coordinate, negative 4. This gives the change of y of 6. Alright, for this example, you have the 'change of x' equals to negative 5, and 'change of y' equals to 6 . With these two examples, you should be able to calculate the 'change in x' and 'change in y.' That is all for this lesson. The next lesson explains the slope of a line. Lesson on the slope of a line. Click play to watch. Calculating the slope of a line from MathExpression.com on Vimeo. After the lesson on graphing, it is time to learn about the slope of a line. If we were to put 2 points here, you will see that we can draw a line through these points. As obvious as it seems, notice that if i move the point up, the line changes. If you were to observe carefully, one of the things that changes here is the slope of the line. The slope of this line increases further when I move this point up. Now that you know this, the next question is can the slope be assigned a meaningful number? The answer is yes. But, how do we do it? With some thought, the most logical way to do this is to take the ratio of the 'change in y' and 'change in x'. As an example, let's imagine that, you run from this point from here to here. In this case,the change in x is 2. When you climb from here to the point above, the change in y will be equals to 3. So, the slope for this case is 3.0 divided by 2.0, which is 1.5. Getting a clearer picture of the slope now? Let's look at the 'change in x' and 'change in y' in more detail. Let me show you the x-coordinates of these points. When you run from here to here. The change in x is 4.0 minus 2.0 which equals to 2.0. Or, simply looking at the grid, 1, 2. For change in y, let me show you the y-coordinates first. When you climb from here to here, the 'change in y' in this case is 5.0 minus 2.0 which is equals to 3.0. Or, simply looking at the grid, 1 , 2 , 3. Let's explore further, see what happens when i move this point around. When i move it to the left, observe what happens. Now, when you run from here to here, the change in x is -4.0. When you climb from here to here, the change in y is 3.0. From this, the slope of this line is 3.0 divides by negative 4.0 which gives negative 0.75. Let me emphasize, the slope now is a negative number. That is all for this lesson. You can move on to the practice questions to test your understanding. You can start by going through the series of slope of a line or pick your choice of question below.